AjiPanda™ is a cute panda icon that conveys someone shy, caring, happy and loyal. It personifies how a humble pack or bottle of AJI-NO-MOTO® Umami Seasoning fills the role of “Your Best Friend in the Kitchen” by offering an ever-reliable way of bringing out the natural goodness of food. 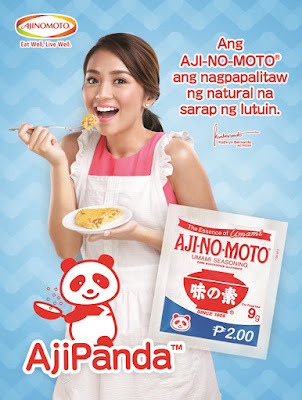 Ajinomoto’s new campaign, which also features teen queen Kathryn Bernardo, presents the benefits of its dependable brand of seasoning to a new generation of cooks and food lovers. effective in making food taste delicious. This is because it is simply free glutamate, the most common among amino acids (the building blocks of protein). It provides the taste of umami to food in the same way that sugar adds sweet taste or salt adds salty taste to food. But what is umami? Umami, is the fifth basic taste alongside sweet, sour, bitter, and salty. It is the savory, rich and full taste we often experience in meat, seafood, cheese, tomatoes and mushrooms. Consider the delightful composition of chicken, green papaya and malunggay in tinola or the medley of cheese, ham, pepperoni, tomatoes, green and red bell peppers on top of a pizza. The combinations and layers of these glutamate-rich ingredients make dishes very delicious and enjoyable. Remember that AjiPanda™, your best friend in the kitchen, will help work wonders in your cooking so that you can share many happy meals with your family. Visit http://www.ajinomoto.com.ph/AjiPanda for healthy and delicious recipes.